A million or more people turn out every New Year's Day along Pasadena's Colorado Boulevard. Some of them camp out on the sidewalks overnight. Others get up in the wee hours to get there. They all crowd along the street to watch dozens of flower-filled floats, bands, and equestrian groups in the annual Tournament of Roses Parade. Don't let that description scare you away. Not only is the event well organized, but there are plenty of strategies to help you enjoy it without feeling overwhelmed. The parade happens on January 1. Most of the time. When January 1 is a Sunday, the parade happens on January 2 instead. It starts at Green Street and Orange Grove Boulevard at 8:00 a.m. The 5.5-mile route through Pasadena turns from Orange Grove onto Colorado Boulevard and then north on Sierra Madre. You can see the route on this map. Don't worry about things going past you too fast. The procession travels a leisurely 2.5 miles per hour. If you need to know anything else that isn't covered below, check the Rose Parade website. Dress warmly. Even in typically warm Southern California, mornings will be chilly. You'll start to get warmer as soon as the soon hits you, so wear layers that are easy to remove in a crowd. Watch the parade from the south side of Colorado Boulevard. If you stand on the other side of the street, the sun will be in your face. You'll find portable toilets along the parade route. They're okay if you need them, but visitors often complain that they get dirty and stinky. It's probably best to "go" before you go. Bring a selfie stick, but not to take pictures of yourself. Use it instead to get your camera above the heads of the people in front of you. Grandstand Viewing is the easiest and most comfortable way to see the goings-on. It's also the most expensive. You can reserve one of 70,000 elevated Rose parade grandstand seat tickets through Sharp Seating. Tickets go on sale in early February for the parade that happens at the beginning of the following year. You and any items you bring into the Rose Parade grandstands will be searched. Backpacks, coolers, and large bags are not allowed. Everybody, regardless of age, must have a ticket for the grandstands. If you want to sit there but need to watch your budget, seats near the route's end are less expensive than at the beginning. If Sharp Seating is sold out, try ticket reseller StubHub. Curbside Viewing from the sidewalk along Colorado Boulevard is free on a first come, first served basis. The City of Pasadena lets people claim sidewalk viewing space along the parade route starting at noon the day before the parade. The best spots are taken soon after that. Overnight camping on the sidewalk is permitted, and fires (in fire-safe containers that are off the ground) are allowed if it's not windy. You can see the parade without camping out overnight, getting up at dawn, or spending a lot of money. Just use the handy guide to watching the Rose Parade the cheap way. It's also good if you decide to go at the last minute. Few people know that watching the parade itself is not the best way to see those astonishing floats up close. On Rose Parade morning, forget those crowds. Sleep late instead while everyone else fights them and watch the parade on television. You'll be comfortable, and you can hear all the commentary. See the Floats Being Made: As the finishing touches go on, some floats-in-progress are on view. You can see them under construction, up to about midday the day before the parade. Tickets are required. Find out how you can watch the decorators in action. Get a Look the Night Before the Parade: Go to Orange Grove Boulevard late on the night before the parade, when the floats move into position. Giant spotlights make the scene almost as bright as day. Go to the Post-Parade Float Display: The afternoon after the Rose Parade and all day for the next two days, you can see the beautiful creations close-up. Allow about two hours to see them all. Tickets are required. To get all the best tips and strategies, use the guide to post-parade float viewing. 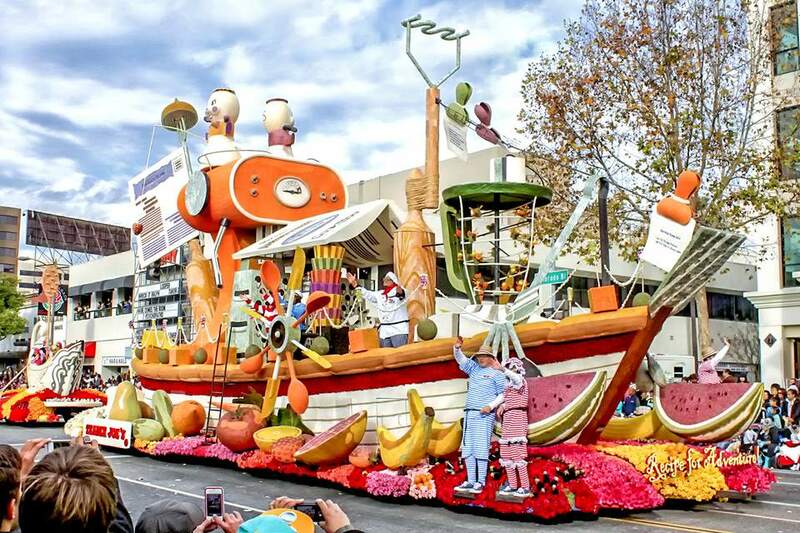 Modest admission fees are charged for each of these Rose Parade events. Buy tickets for any of them through Sharp Seating. Equestfest: Besides the floats, the Rose Parade also includes about 20 equestrian units and about 400 horses. Some of them strut their stuff at the Los Angeles Equestrian Center in Burbank. Visitors can tour the stables, talk to riders, take pictures, and watch trick riding and roping demonstrations, drills, and dances. Find out more about the Equestfest. Bandfest: Two days before the Rose Parade, some of the 20 or more all-star bands that will march in the parade perform in a field show at Pasadena City College, 1570 E. Colorado Blvd. Get all the details for Bandfest. Pasadena hotels near the parade route sell out many months before the parade. If you tried too late but are determined and organized, you can check each hotel's last day for cancellations and try again then. You can also look for a hotel in East Pasadena along East Colorado Boulevard and within walking distance of the Metro Gold Line. Get some ideas for where to stay in Pasadena. Downtown Los Angeles is also another good location to stay before the parade, especially in Little Tokyo. You can catch the Metro Gold Line to Pasadena from there, and walk from the station to the parade route. However, downtown hotels can be super expensive on New Year's Eve. Staying anywhere else in LA is a balance between expense and sleep. If you choose a hotel that's close to a Metro line, don't drive. Use the Metro instead. Paid parking near the Rose Bowl Parade route is available on a first come, first served basis. But this is a case where you have to be the super-early bird to get one before they fill up. You can also reserve a parking spot through Sharp Seating or Easy Parking Service. Overnight parking on Pasadena streets is allowed beginning at noon the day before the parade, for that evening only. No Parking areas and red curb zones remain off-limits, and you can't park on the parade route itself. Directions to the Rose Parade are on their website. Metro Rail's Gold Line makes it easy to get to the Rose Bowl Parade, but you may have to change trains to get there if you start from somewhere other than downtown Los Angeles. Exit at the train at the Del Mar, Memorial Park, Lake or Allen stations; all are a short walk from the Rose Bowl Parade route. Parking your personal motorhome or RV along the Rose Bowl Parade route may be the least expensive, most comfortable and convenient way to go. And it can be fun, too. However, you'll need to make your reservation nearly a year in advance. If want frontline RV parking along the parade route or RV parking nearby, reserve it through Sharp Seating.